Okay, friends, lots to cover today. 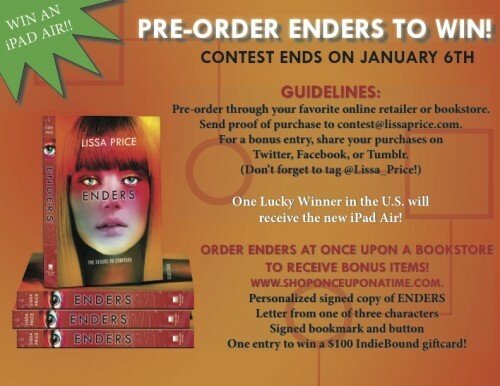 It’s the last day for the Enders pre-order contest to win the iPad Air. You can either do your pre-order anywhere (online, your favorite bookstore) and in any form (e-book, hardcover) OR you can order from my official bookstore (the closest one to me and a great indie store) and get the iPad entry as well as a chance to win a $100 gift card. Everyone who orders from Once Upon A Time in Montrose will get a button, a book inscribed to you, and a letter from a character. But you only have until 6pm EST today (that’s 3pm PT) to get those emails to contest@lissaprice.com I do not see these, someone else will compile and add the bonuses and then the winner will be selected randomly. I will announce at the launch party tomorrow at Vroman’s Bookstore 1/7 (anyone local should come, it’s going to be fun – two actors will read a scene from Enders). I can’t wait to see who wins! Maybe it will be someone there because you can still pre-order from Vroman’s and pick up your book that night. The STARTERS Kindle DEAL is still on! But it is temporary so send your friends who don’t know about Starters there now. Otherwise, you’ll have to hear them cry when they hear about Enders and realize they need to go back and get Starters and it’s no longer $2.99. I’M NIKKI! . ‏@OlaLeNikki22h READING ENDERS AND I F-ING LOVE IT!!! @Lissa_Price WORTH THE WAIT!!! I AM SO EXCITED!!! Me too. One more day. Previous Post: STARTERS is a Kindle DEAL! So the iPad contest is over, winner to be announced tomorrow around midnight. The Once Upon A Time is still going on but hurry.